Siteground Review 2019: Is it the Best Web Hosting? Are you looking for a reliable, fast and affordable wordpress hosting to host your website along with a FREE SSL certificate? Well, I am going to share updated SiteGround review which provides all of these stuff at very reasonable price. SiteGround is one of the WordPress people's recommended web hosting service to host a WordPress powered blog or website. They deliver an awesome 99.99% server uptime and an in-house built SuperCacher feature to load your websites blazingly fast. It doesn't end here, their all plans come with SSD based storage to render your site's content even faster than the regular drives. Now, you might think that SiteGround really offers cool stuff and services. Yes, you're right they are. 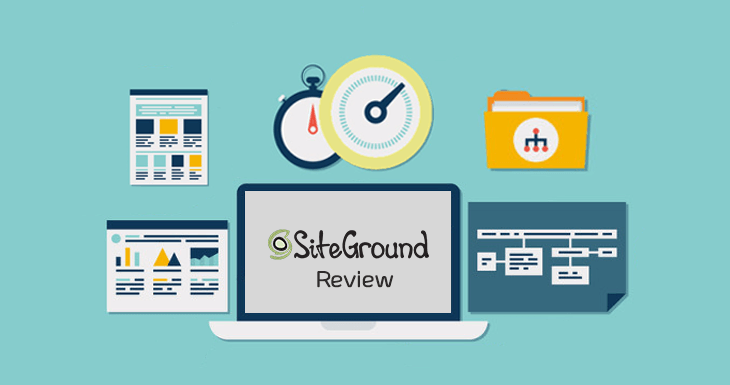 Let's get deeper in this SiteGround Review to know more about them and I hope after reading this review you will be able to decide whether it's the right WordPress hosting for you or not. SiteGround, being founded in 2004 by some university friends. Right now, managing over 500,000 domains under their platform. The company employs more than 400 people, they have managed to place their data centers in four different countries of three continents. I have seen many bloggers suggest using SiteGround as it’s not in the cliched EIG bandwagon (if you know what I mean). But, keep in mind one thing, Some hosts under EIG company have quite good reputation. SiteGround has a bunch of unique features such as SuperCacher, 99.99% uptime, Linux Containers to handle unexpected traffic spikes, SSD storage for all plans, Automatic daily backups and much at the very affordable prices. After reading this entire SiteGround review, you will be able to find out whether this hosting provider worth your time and money or not. Are you ready to get deep into the business? You get a number of features with every plan you purchase on SiteGround. Let's talk about each and every one in details. Recently SiteGround has made a change, and they are not offering any free domain name with web hosting plans. Why? They officially revealed that almost all of their customers have a domain name. So, you can say most of the SiteGround users are experienced bloggers and webmasters. And they moved to SG for better performance, website speed loading, tight security measures, and robust customer support. Unfortunately, you won’t get a free domain with any web hosting plan. If you’re also an old or experienced user like me, then it’s not a big deal. Do you believe some hosts charge more than $100 for site migration? Yes, it's true. But, Here's a great news for you. SiteGround has a free site migration policy for all of their customers. They will help you move the entire site resources from the other host to their servers. If you're tired of your current host due to down times, slow server speed and poor customer support, then choosing SiteGround would be a great move. Am I only the one who don't like to visit a slow loading website or you also don't? Today, no one likes to visit a slow loading website. Such sites keep on losing regular websites, and the bounce rate is on the higher side too. Usually, visitors hates a site which takes more than 3 seconds to load. That's why SiteGround uses Solid State Drives to store all of your site content to deliver with maximum possible speed. SSDs offer the best speed as compared to regular hard drives. All the plans come with SSD storage, no matter you choose shared or cloud hosting. Being a website owner, you may know what caching is. It is the way of saving files in an accessible space not to download again. WordPress employs server-side caching with the help of a cache plugin (W3 Total Cache and WP Super Cache are two popular options). What if you get to use a cache plugin from the hosting provider itself? That's SuperCacher, SiteGround's own plugin (for Joomla and WordPress) to load your site faster. I don’t think you need an article to be aware of the importance of taking backups. No one can tell what will happen in future, even in the next moment. So, the backups help you recover from any danger, be it hacking or any incompatibility issues. SiteGround offers daily backup for every plan and, they keep 30 backups for higher packages. Content Delivery Networks or CDNs work as a medium between your visitors and your website. Let's assume that a person from Asia visits your site, which is hosted in the US. If you have CDN enabled, the site content will be served by the closest server from the visitor location and thus your site will load faster than normal. SiteGround's cPanel has free CloudFlare CDN which can be enabled with just a few clicks without changing NS records. Enabling CDN along with SuperCacher dramatically improve your site speed. You know SEO, don't you? The art of bringing websites to the top of the search results is termed as SEO (Search Engine Optimization). But the fact is SEO world is changing. You can't rank a site with the strategies used ten years ago. The newest trend in the SEO field is SSL certificates which add the prefix https before URLs. Google already announced in 2014 that they use HTTPS as a ranking signal and give more authority to the sites having SSL enabled. So, using SSL could help you improve ranking in search engines. SiteGround provides free Let's Encrypt SSL with every plan (even for the basic). As you choose or upgrade higher plan, you get one-year free Wildcard SSL. Virtual Private Servers are known for better scalability. But SiteGround doesn’t offer it. Is what you think? Then you are wrong! The cloud hosting is the same as VPS hosting but with some advanced features. So, you will never find it difficult to upgrade your resources. They have fully managed and scalable servers to up update system resources without rebooting the server. You can also setup automatic scaling which increases resources on sudden traffic spikes. SiteGround's WordPress team is so quick in rolling out the updates that you may see a notification within an interval of even a week. Say you are on a vacation that you can't login to the dashboard. There comes auto update feature for the rescue! It automatically updates your WP version to the new. Do you have a habit of playing with command line interface? Then, you are going to love WP-CLI as it is a set of command line tools using which you can update plugins, configure multi-site installs, etc. without even opening a browser. To learn more, visit this link. Make sure you know the commands well before getting your hands on it. We don’t always like to see the changes we make on our site, to the public. Sometimes, we need to test the feature and then deliver the same to the audience only if it works well. Unfortunately, WordPress holds no such tools with it. But SiteGround does! You can test anything in the backend with the help of staging option. You can test new plugins, themes, or functionalities without making them publicly accessible using this feature. It's an advanced level approach, so you should take necessary steps before doing anything. For safety, take an entire backup of your site. They have a broad set of 50+ themes that you can download for free. But I recommend using a premium theme, to be frank. ThriveThemes and Genesis are well-reputed WordPress premium themes providers to buy any type of template for WordPress websites. Of course, they are doing an excellent service by giving half a ton themes for free. If you have no budget to buy premium WordPress themes then free WordPress theme could be a great alternative to start a website. Maybe you don't want to use any Content Management Systems that you like to design a website on your own. The whole idea may seem to be a chaos provided you have zero coding skill. But no! SiteGround has a WYSIWYG (What You See Is What You Get) site builder that supports drag and drop. If you want to buy best paid theme for your WordPress powered blog or website then I highly recommend using ThriveThemes. Because their themes has great built-in features and conversion focused to help you get more leads, sales and email subscribers for list building. ​Every Thrive Theme comes with unique functionalities, SEO friendly, Clean coded and light weight to load your website within a blink. Must check FocusBlog and Rise theme. Are you a beginner in WP? Do you want to know the advanced tricks like WordPress translations or loop? For both the uses, you must refer SiteGround WordPress tutorials. They have a broad range of topics covered under different categories. The video tutorials make your learning curve easier. The tutorial section will help you learn How to Install WordPress, Take Backups, Updateplugins and themes, Improve speed and security, Transfer your website and much more with step-by-step guides. The cPanel is the toolbox of your hosting account. Most of the tasks like installing a CMS, managing emails, setting up CDN and much more are done from cPanel. Click here to have a demo of SiteGround cPanel. You know what I am talking about, don’t you? The confusion-free interface features many tools categorized under precise labels to make the navigation easier. A professional email address is more than mandatory these days. As your website gets bigger and better with the increase in audience and monetary sum, you need to hire more people. Obviously, you have to give them an email address too. There you see the importance of unlimited email addresses! And, SiteGround provides you the same. For a hosting provider, customer support is the backbone as it keeps the existing clients and help users to fix their issues. Using Live Chat you can contact the support within 10 minutes but in my experience, they respond with 2~3 minutes. Personally, I found them one of the fastest customer support providers in the industry. Yes, you heard it right! SiteGround provides 24/7/365 days customer support via Live Chat,Phone and Ticketing system. When it comes to higher packages, you get priority technical support with relatively low waiting time. In case you don't like them and found their services below the expectations they claimed and want to leave them. Then do it within a month, SiteGround will give your money back as they offer a 30 days refund policy. Let’s review the SiteGround's hosting plans and prices now. You know several types of hosting are there, don’t you? Even the legendary Pat Flynn started his career with a simple shared hosting plan. If you are about to create a new website, I recommend not looking at any other hosting plan, just grab a shared package right away. You are free to look at other hosting types in this list as you want an advanced plan with more dedicated resources. SiteGround offers three shared plans; each of them differs in both price and features as well. You can read overviews of all of them below. The cheapest among the lot is Startup shared hosting plan that will not make you borrow money from others. They say you can host an average blog or a small e-commerce website with a reasonable number of products using this plan. And, an official caution is given that you should not use it unless your site gets more than 10,000 page views a month. You can't host more than one website and never should surpass the 10GB storage boundary. Even its the cheapest plan but still you get a free domain name, daily backup, free site migration, unlimited traffic and MySQL databases, WP-CLI and free let's encrypt SSL. Isn't a great deal? By spending only a dime of $3.95 per month, the features they offer is exciting. This package is highly suitable for beginner level sites or if you just want to start blogging journey. Say you want more than 10GB storage space and multiple websites support. Then, you need to overlook the previous one to eye on GrowBig plan. The 20 GB storage along with support for unlimited websites makes this plan a bit advanced than the previous one. The unique features include SiteGround’s in-house cache plugin (Supercacher), premium support and security. You need to pay for premium support in Startup plan. The premium security holds a promise of having 30 days’ backup files of your websites on their server. 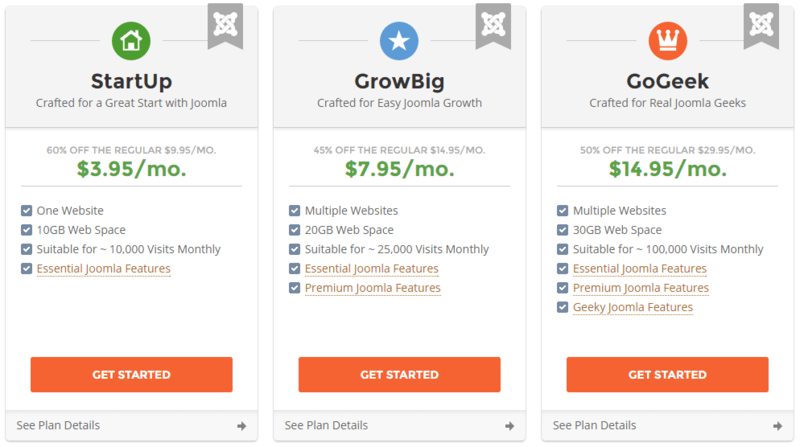 GrowBig plan can handle 25,000 unique visitors monthly at the prices of $7.95 per month. You can’t host more than one website and never should surpass the 10GB storage boundary. Even its the cheapest plan but still you get a free domain name, daily backup, free site migration, unlimited traffic and MySQL databases, WP-CLI and free let’s encrypt SSL. Isn’t a great deal? Do you want the host for your WordPress blog? SiteGround has a managed WordPress hosting services too. Let’s get to know it in detail. You might have skimmed through the shared hosting section in this article. The core features remain the same as those. As this type of hosting is intended for WordPress, you will get some additional WP-friendly features. 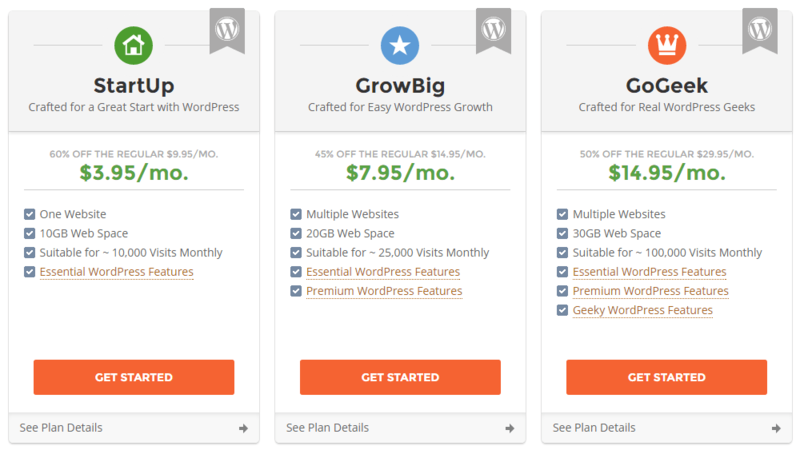 They offer three WordPress hosting plans; StartUp, GrowBig, and GoGeek (same as usual Shared hosting). All the core features remain the same, but there are some differences in WP options, that you can read below. You may not be familiar with the term cloud hosting, right? If you planned to increase the performance of your website, this one would be a great choice because it's between both shared and VPS hosting. The best thing about cloud hosting is it makes the scalability and downgrading easier like a walk in the park. As it gathers resources from multiple machines to work as one system, you will get a high powered server with a cloud hosting service. SiteGround offers four pre-made cloud configurations and a feature to make your own plan with custom specifications. The cloud hosting plan of SiteGround starts at the price of $80 per month. You will get dual CPU's and 4 GB Ram. The storage space is enough for a medium level blog as 40 GB is one heck of storage in blogging. I don't think any regular WordPress blog will surpass the monthly bandwidth of 5 TB. When it comes to Business plan, the half of the specs are upgraded as compared to the first plan. You get 3 CPU's power, 60 GB storage, 6 GB Ram and the same bandwidth of 5 TB like "Entry" plan. To take benefits of this package, you have to pay $120 per month. In case you want to have more power and storage space, Business Plus plan would be good for you. You get 4 CPU's, 8 GB of Ram, 80 GB SSD storage and 5 TB bandwidth at the price of $160 per month. If you have a giant site and getting a lot of traffic then choose this package. Do you want the best in power, storage space, and RAM? Maybe you are not in a position to buy a dedicated server. Then the Enterprise package is the best bet. You get an Octa-core CPU, 10 GB of RAM,120 GB SSD disk space and 5 tera byte bandwidth at the price of $240/month. Note:﻿ ﻿By clicking on "Create Your Plan" link gives you multiple sliders to customize the options for creating your own package. Though the pre-made plan gets you a maximum of 10 GB RAM, 120 GB space, and eight core CPU, the custom panel provides you with much more. If you ask me for the best hosting plan regarding performance, I can't help suggesting dedicated servers. But the main reason that repels people from purchasing a dedicated plan is expensiveness. As you can see in the image, you get the freedom to choose between servers from three data centers; America, Europe, and Asia-Pacific. The basic server starts at a price of $229 per month. You will get a machine with Intel Xeon E3-1230 CPU clocked at 3.20 GHz. You can host a medium scale e-commerce site on this server as they provide you with half a TB storage, 4 GB RAM, 8 CPU threads and 8 MB cache. The bandwidth remains the same throughout as five terabyte. 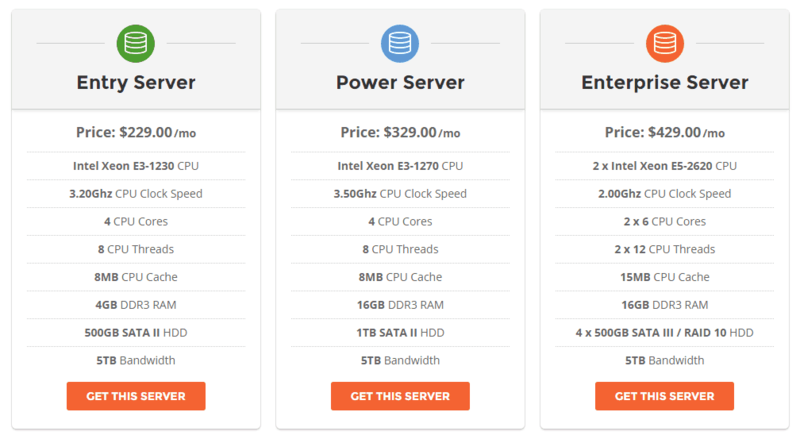 With this plan, you can get your hands on a better server with a powerful CPU of higher speed (3.5 GHz), 16 GB DDR3 RAM and 1 TB disk space if you are ready to pay extra 100 dollars for the Power Server. Everything else remains the same as in the first plan. Of all the hosting service SiteGround offers, I recommend Enterprise Server as the best one to be used for personal projects. But you have to pay $429 per month for this. I know you may think the clock speed of 2 GHz as ironical given the fact that Power Server holds a 3.5 GHz processor. Brace yourself! You get two CPU of 2 GHz speed that makes it total 4 Giga Hertz. Both the CPUs are hexacore. Means you receive a whopping 12 core CPU system. Other features are 24 CPU threads, 15 MB cache, 16 GB RAM and 2 TB SATA drive. Are you looking forward to diversifying your income? Well then, you must try out reseller hosting. Unlike most of the providers, SiteGround has a credit based reseller program. The plan starts from $45 per year where you get to spend a maximum of 5 credits only (1 credit= $45/year). Higher the number of credits you purchase, the lower the price of each will be. You need at least five credits to start with. The credits can be used to activate or renew hosting accounts. The comprehensive dashboard aids you in the seamless management of your clients’ hosting accounts. Don’t you want to acknowledge the fact that you are a reseller? SiteGround makes it easy for you to brand your business with theirwhite labeled cPanel one can easily integrate their logo and have private DNS feature for better branding. If you are a web designer or developer who not only creates sites but monitors them, I recommend trying their reseller program. The management has been made easier. You can visit their reseller F﻿﻿﻿A﻿﻿﻿Q here for clarifying further doubts. As in Joomla hosting, SiteGround has three plans here with the same specifications like WordPress hosting packages. The differences are in Joomla related features. As an owner of a website powered by Joomla, you need to deal with databases. SiteGround allows you to create and manage unlimited databases. The number of internet users is increasing every day. So is the number of hackers too. A webmaster should ensure the maximum security for their website. SiteGround has a special plugin called JHackGuard for those who like to build their websites on Joomla. You never need to know the release of a new version. They have made it automated to make sure you always use the latest. Maybe your Joomla site is hosted on another host. The technical guys in SiteGround take care of every migration related activities if you purchase their plan. We are at the end of our SiteGround review. What do you think? Is it worth your time and money? If you turn the mike to me and ask the same question, my question would be a big YES. They have a quite good range of services with exceptional support to WordPress. What else a WP blogger wants? But the close examination of all their features renders the fact that the specs are impressive. And yeah, they offer 99.99% uptime too! So, head over to SiteGround website now and, buy a hosting plan now. As long as money back guarantee period doesn't expire, you have nothing to lose. Please do let me know what you think about SiteGround, Is it really a best wordpress hosting service? SiteGround is one of the recommended hosting services for WordPress to run a smooth website. They offer an outstanding, blazingly fast SSD powered storage, 99.99% server uptime, Super Cacher and Free site migration just at $3.95 per month.